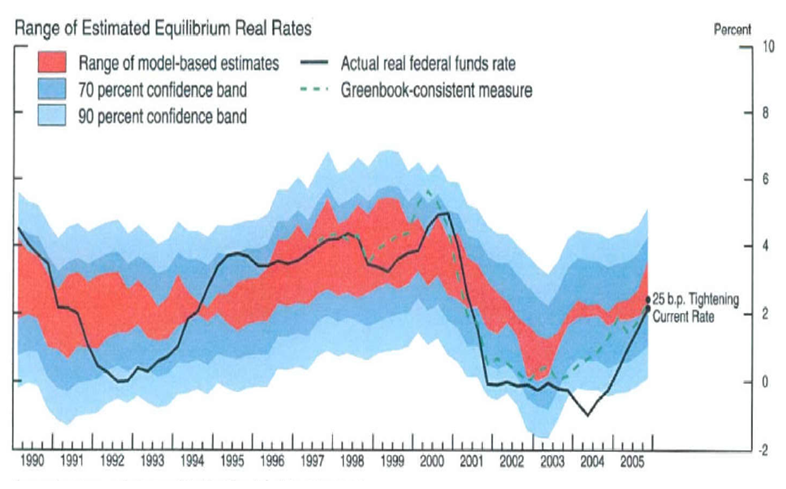 Macro Musings Blog: The Data Problem with the Natural Interest Rate Debate and How to Fix It. The Data Problem with the Natural Interest Rate Debate and How to Fix It. Many observers claim the Fed has been keeping interest rates artificially low over the past five years. They contend this low-interest rate policy is creating financial instability via an unnatural reach for yield and harming folks who depend on fixed income. They want to see the Fed raise interest rates now. Paul Krugman has recently taken it on himself to contest this view. His reply is that interest rates can only be artificially low if they are below the natural interest rate level, but he sees most evidence pointing to the opposite case. Interest rates appear to have been higher than the natural interest rate level and explain the persistence of the slump. This situation arises because of the zero lower bound as explained here. Accordingly, monetary policy has been effectively tight. I agree with Krugman that when thinking about an interest-rate targeting central bank one should look at the gap between the actual and natural interest rate to determine the stance of monetary policy. Otherwise, one could conclude monteary policy was tight in the 1970s and loose in the 1930s. No one would make that argument. So the interest rate gap makes more sense. But there is a big problem with this approach. There is hardly any data on the natural interest rate. The Fed provides none and there are only a few private estimates of it. This debate will never be settled without some consensus measure of the natural interest rate and currently there is none. As I argued before, this should be a scandal for an interest-rate targeting central bank. It would be akin to a central that targets the M2 money supply but chooses not to publish M2. Yes, the natural interest rate is trickier to measure than the money supply, but the Fed already estimates its as seen in this figure from a 2005 FOMC meeting. At a minimum, the Fed should be reporting its estimates for the natural interest rate across the entire term structure of interest rates. It would go a long way in ending the confusing over the stance of monetary policy and would keep the Fed more accountable for its actions. That's the minimum. It would be even better if the Fed started regularly surveying market participants, forecasters, and other interested parties on their estimates of the natural interest rates across the term structure. Then report the distributions of these estimates along side the Fed's own estimates. The Fed has the resources to do this, so why not? All this information would be bring much clarity to the big debate on natural interest rates. Until these changes happen, I look forward to more confused discussion about the stance of monetary policy. Adopting these policies would be a great way for Janet Yellen to leave her mark at the Fed. PS. Yes, this is a pragmatic proposal. I actually would like the Fed to switch to NGDP level targeting and stop using short-term interest rates as an intermediate target. Rather, I would have the Fed look to a NGDP futures contract as its intermediate target and adjust the monetary base accordingly. There is also a place for Divisa monetary aggregates as indicator variables, as shown by Michael Belongia and Peter Ireland. Had observers in this debate been looking at them, they would see that monetary policy has been tight. Has the Natural Interest Rate Really Been Negative for the Past Five Years? "I would have the Fed look to a NGDP futures contract as its intermediate target and adjust the monetary base accordingly." How much more than present would you need to increase the monetary base by to reach your NGDP target if possible? Its been almost doubling every year since 2008. Maybe the MB under the current system has a limited effect on NGDP. Will expanding the MB excessively undermine credibility of the fed? Anon: the Fed could also decrease IOER. But if buying, say, $2 trillion more in QE had provided more stimulus, then why not? Thanks Benjamin. Care to expand on the global capital glut? David, You are right. Getting the natural real rate correct is key. And that includes knowing the output gap correctly. Many justify low nominal rates based on low inflation, higher than normal unemployment and a large output gap. Yet having the current real rate lower than the path that the real rate should rise up during the expansionary phase of the business cycle does not necessarily create inflation or even a more quickly growing GDP. The Fed can be behind the curve and still not produce inflation nor quicker GDP growth.